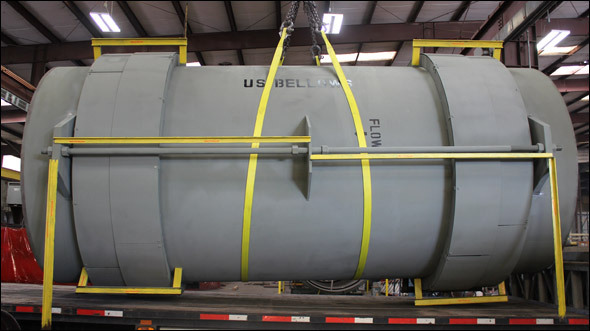 U.S. Bellows, Inc. custom designed and fabricated tied universal expansion joints for a vapor line used for rail car loading at the Houston ship channel. The expansion joints are 12″ dia. x 40″ O.A.L. The bellows are fabricated from 304 stainless steel and the flanges and limit rods are carbon steel. They are designed for 100°F at 1 psig and capable of 5″ axial movement. Each unit was 100% dye penetrant tested and soap and air tested prior to shipment. 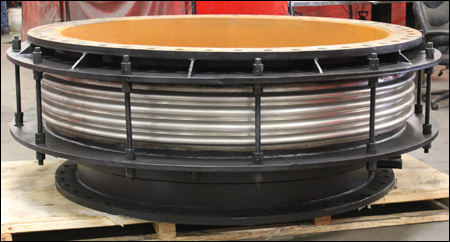 U.S. Bellows custom designed tied universal expansion joints with 304 stainless steel bellows from 2″ to 18″ diameter for a chemical plant in Texas. 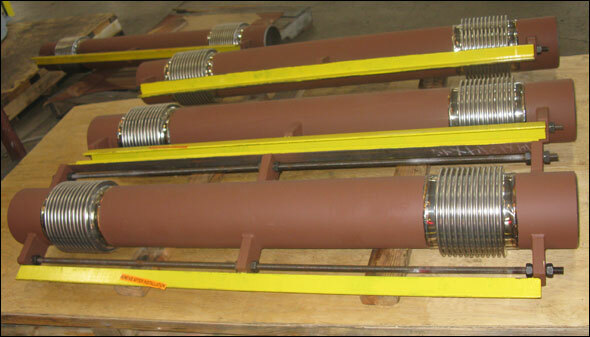 The expansion joints are designed for 3″ lateral movement at 122°F and 100 psig. The expansion joints were hydro-tested at 150 psig and delivered in six weeks. 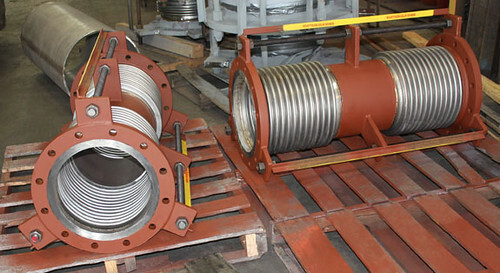 This tied universal expansion joint with control rods was designed for an oil recovery plant in Canada. It is 48″ in diameter and 68″ in overall length. This expansion joint was designed for 1″ compression, 4″ lateral and 15 psig at 150°F. The pipe was fabricated from A-36 carbon steel material and the bellows were fabricated from 316L stainless steel. A dye penetrant exam, air and soap test, along with a vacuum test was conducted prior to shipping. 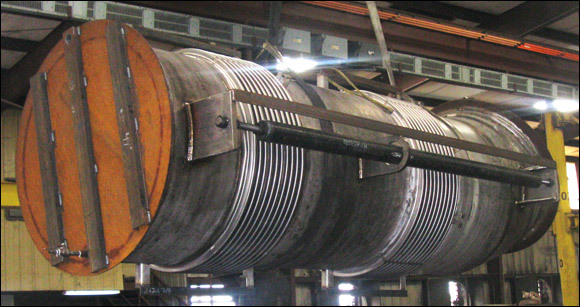 A tied universal expansion joint was custom designed for service in an acid regeneration plant in Louisiana. It is 48″ in diameter, 141″ in overall length and designed for 1″ axial movement, 2-1/2″ lateral movement and .33° angular rotation. The expansion joint is fabricated with 310 stainless steel bellows, and 301 SS liner, duct, flanges, transition duct and covers. It was designed for 10 psig at 1150°F, and was dye penetrant examined, hydro-tested at 15 psig, and the bellows and pipe longitudinal weld seams were 100% x-rayed. 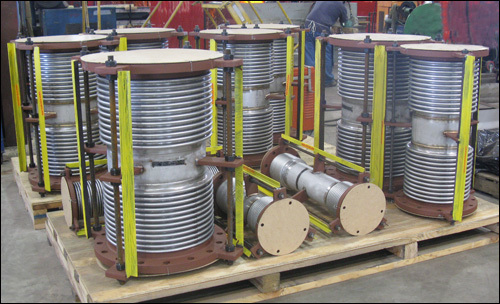 U.S. Bellows designed and fabricated tied universal expansion joints and single hinged expansion joints for a power plant in Canada. All the units were fabricated from carbon steel with 316 stainless steel bellows. The universal tied joints are 102″ diameter, 225″ long and are designed for 8.2″ lateral movement. 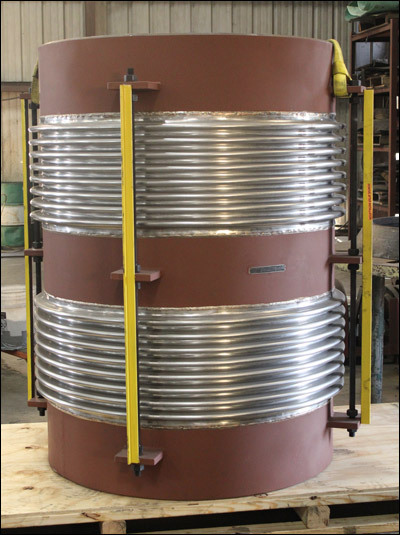 The hinged joints are 102″ diameter, 71″ long and designed for 0.76° angular rotation. Each expansion joint can withstand temperatures up to 250°F at 7.25 psig. The bellows and pipe long seams were 100% x-rayed, and all the welds were 100% dye penetrant tested. A soap and air test was performed prior to shipment. This single tied expansion joint is custom designed with Inconel® 825 bellows with carbon steel flanges, liners and pipes. It is 76″ I.D., 90″ O.D. and is 31-1/2″ long. It was designed for 1,900°F at 100 psig with 1″ compression. A meshed expanded metal cover was installed to allow for hot air to escape. Tests performed included a 100% dye penetrant, x-ray, and ultrasonic on pressure bearing welds. Finished units were hydro-tested at 1.5 times the design pressure. The expansion joints were designed with an inner liner to accommodate for easier field installation of refractory lining. 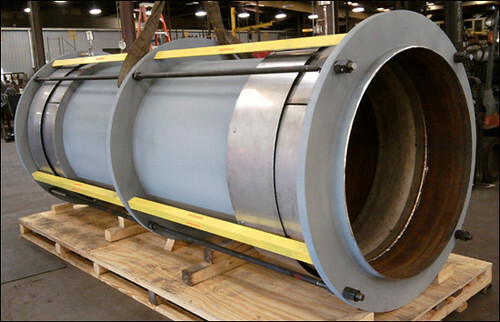 This week’s feature is on tied universal expansion joints designed for piping in a power generation plant in Texas. They are 6″ in diameter, 60″ in length, and will be used in a hot air application. The pipe, lugs and weld ends are fabricated from carbon steel, and the bellows are 321 stainless steel. The expansion joints are designed for 100°F at 3 psig and are capable of 6″ lateral movement. Each unit was 100% dye penetrant tested and soap and air tested prior to shipment. 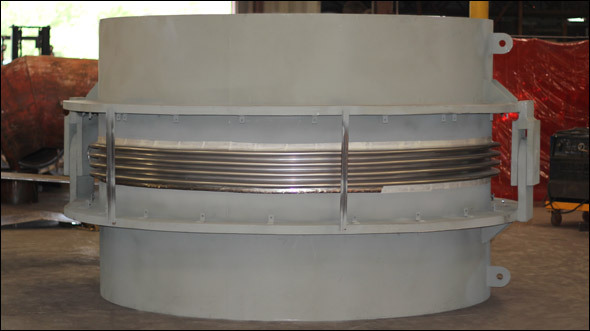 This tied universal expansion joint will be installed in an oil refinery in Louisiana. The assembly is 48″ in diameter and 150″ long. The bellows are fabricated from two plies of Inconel 625 LCF with stainless steel mesh between the plies and the weld ends and all hardware are A 516 GR 70 carbon steel. The design temperature is 500°F at 38 PSIG with 5″ lateral movement. The bellows were 100% x-rayed and hydro-tested to 76 PSIG. A pneumatic test between the plies at 15 PSIG was performed prior to shipping. This tied universal expansion joint with a 45 degree mitered elbow will be installed in a flue gas system. The assembly is 60″ in diameter and 215″ long. The pipe is fabricated from A 516 GR 70 carbon steel and the bellows are Inconel® 625 LCF. The bellows were 100% x-rayed and hydro-tested to 15 PSIG prior to shipping.